Carrie (Laughlin) Loveland has been playing in the water for as long as she can remember! Growing up, she swam competitively for several years and was just 10 years old when her father, Terry, founded Total Immersion Swimming in 1989. She began assistant coaching at Total Immersion weekend freestyle workshops in 1999, when she was a sophomore at Wesleyan University. Following college, she coached several competitive youth teams, including Schwimmclub Meilen in Zurich in 2003 (where she learned to coach in Deutsch! ), Cheyenne Mountain Aquatics in Colorado Springs in 2004, and finally, the New Paltz Hawks from 2004 to 2007. Since 2005, she has taught at the Total Immersion Swim Studio in New Paltz. The studio setting allowed her to significantly expand her skill set to include infant and toddler lessons, children of all ages and abilities, adult water-phobic and beginner lessons, as well as the classic T.I. “swimming improvement” classes for adults. In addition, she holds an M.S.Ed (with a focus on early childhood) and has considerable experience working with both mentally and physically disabled students. She is an avid open water swimmer and competed in the 2007 USMS 2-Mile National Championship in Lake Placid, where she placed first in her age-group. Her passion is giving the gift of harmony and enjoyment in the water to as many people as she can. 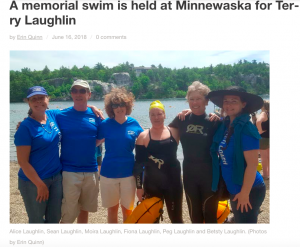 On Saturday, June 9th, 175 swimmers and numerous volunteers gathered at Lake Minnewaska for the inaugural “Terry Laughlin Celebration Swim” — the first open water memorial event for Terry this season, put on by Dave Barra and his organization, New York Open Water (NYOW). After a relatively cool May and early June, we were lucky enough to be graced with warm, sunny weather and a water temperature of about 70 degrees. 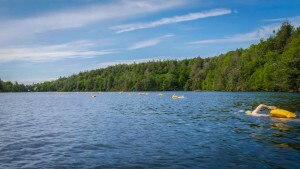 Designed as a non-competitive event, the swim was a triangle course of 0.75 miles, in which participants were invited to swim whatever distance they desired in the allotted time of 3 hrs, from 10 A.M. to 1 P.M. Many swimmers chose to do a quick sprint distance with just one loop of the course, while a surprisingly large number swam continuous loops until the clock ran out. It was a relaxed and convivial atmosphere– one Terry would have certainly reveled in– and the swimmers were extremely well-supported by the volunteers for the event. 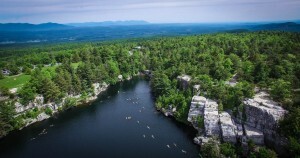 Located in Minnewaska State Park, near Terry’s hometown of New Paltz, NY, Lake Minnewaska is a pristine mountain lake nestled atop the Shawangunk Ridge ( “The Gunks” to locals) and was Terry’s favorite and most frequent spot to swim, featured prominently in much of his writing and videos. He never missed the chance to join the Minnewaska Distance Swimmers’ opening day toast with season-fresh local strawberries and a group song, “This Lake is Your Lake” (sung to the tune of “This Land is Your Land,” by Pete Seeger, another Hudson Valley resident with a passion for our local waterways). Always a bit mournful on the last day of swimming at the lake on Labor Day, Terry immediately looked forward to the opening day of swimming in mid-June the next year… nine months away! Lake Minnewaska was, without a doubt, a second home to him, so much so that he even requested that some of his ashes be scattered there. As one of his daughters, it felt like the perfect way to remember our dad. Last August, on a long drive home after the two of us swam a 2.5K race in Lake George (the last swim event in which he competed), we spoke a lot about what a beautiful swim we were able to share there and how grateful he was to still be able to swim, even as Stage 4 cancer took its toll on him. While our family always strived to remain optimistic as his health declined, the shadow of his cancer’s steady march was always in front of us. So, with that in mind, I said to him: “Dad, let’s imagine you live a long time… Someday–hopefully in the far future, not necessarily soon– would you want a memorial swim named for you after you die?” He said, “Yeah, yeah… that would be great. 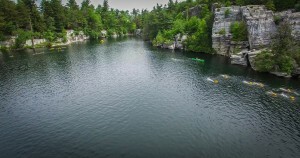 I’d love that… That would be really nice.” When I asked him to specify where, he said he’d have to think about it– he had so many favorite swim spots over a lifetime of swimming open water around the world– but I knew he was thinking about Minnewaska. It’s the first season I (and so many who loved him) have ever swum there without him, so it was bittersweet, and a bit surreal, to not see him there with all of us– but he was absolutely there with us in spirit. It’s almost impossible to take a stroke there (or anywhere) and not think of him. And as a little symbolic gesture, I had his laminated membership card for the MDSA (Minnewaska Distance Swimmers Association) with me as I swam the event. For the entire swim, I was picturing him swimming along with all of us around the lake, enjoying his favorite activity in his favorite place, on such a spectacular day. I was imagining him sync swimming next to me, matching the rhythm of each of my strokes with his own, just as we did on countless swims throughout my life. It was very touching to see all the people who came out that day to honor him and celebrate his life, his passion for swimming… and his zest for life itself! This event was truly a life’s dream for him and although it wasn’t originally planned as a memorial swim, I’m so glad that Dave had the chance to tell him it was finally happening, when he visited Terry during his final week of life in the hospital last October. The Laughlin family extends our huge thanks and tremendous gratitude to event director and close friend of Terry’s, Dave Barra, and his organization New York Open Water for putting on an amazing memorial swim at his home lake, to honor and celebrate Terry’s life, his friendship, his love of swimming, his contributions to the sport, and his enduring positive influence on the people whose lives he touched. It was a fantastic event and we had a beautiful day of swimming and open water camaraderie! Thank you also to Minnewaska State Park for allowing NYOW to host this event at Terry’s favorite spot to swim, and thank you to the park employees and the local EMS crew who supported this event. Thanks to all the volunteers who came out to help, including: the volunteers for NYOW, Terry’s wife Alice Laughlin and numerous members of the Laughlin family, staff and former staff of Total Immersion, Keith Woodburn, Tracey Baumann, Angela Dorris, Carsten and Krisha Patenaude Stoever, Jim and Denise Ullrich, Clare Kelly and Bob Fagan. And, of course, THANK YOU to all of Terry’s friends, colleagues and coaches, fellow community members, T.I. students and fans, former swimmers from Terry’s teams, and open water enthusiasts who came out for this memorial celebration swim! It was a great day and fantastic swim because of ALL OF YOU! Thanks again to everyone– it really meant so much. A beautiful account of the memorial swim, written by Erin Quinn, appeared in last week’s New Paltz Times. Erin is the Head Coach of Hawks Swimming and is also an Award Winning Journalist who has written for The New Paltz Times, The Woodstock Times, The New York Times and Swimming World Magazine. 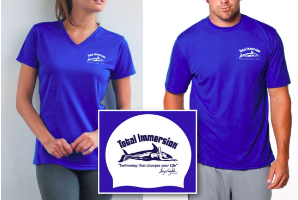 Get your Limited Edition Terry Laughlin Signature Sports Tee Shirt and Swim Cap now. Sorry to have missed it! We were there in spirit with all the TI swimmers and Terry – signed a huge TI fan! I couldn’t be there and made my first 1k open water in France I thought about Terry during my race. I hope to come on August for a next one maybe…. ?